I'm so happy to present my finished Kingfisher quilt! I so enjoyed making this one, not the least because of your enthusiasm along the way. This was really the perfect time of year for a portable stitch-along. Maybe we'll do it again! A big thanks to Jodi at Tales of Cloth, without whom the Kingfisher Stitch-Along would not have come to be. And kudos to our event sponsor, Cottoneer. who supplied so many delectable fabric prizes. This week one lucky participant will win 4 yards of quilting cotton - winner's choice - from Cottoneer to use for Kingfisher backing. Post your photos #KingfisherStitchAlong throughout Saturday for your chance to win. Before I chose fabrics for my Kingfisher, I already knew the direction Jodi was heading with her gorgeous scrappy/low volume version. I wanted to make something totally different, so I opted for a controlled color scheme and a variety of values in my background diamonds. Early on my color scheme felt risky. Especially, focusing on red/green seemed a bold combination. Adding in so much navy and purple gave the complementary red/green a softer glow. I'm glad I tried something different and ended up with a truly unique palette. One turning point was discovering Mediterraneo by Katarina Roccella for Art Gallery Fabrics. I used Mediterraneo fabrics for the partial diamonds and all the border fabrics. The olive foliage print really tells a story. I think it's so romantic and pretty, just like this quilt design. I wasn't sure about using the olive foliage for any of the full diamonds, but decided to just try it out after second guessing myself so many times. In the end, that really makes the quilt for me. I love how the olive foliage print surrounds the flowers and bleeds into the center of the quilt. Naturally I backed it in the same! Such a gorgeous fabric. For quilting I toyed with several custom quilting designs. 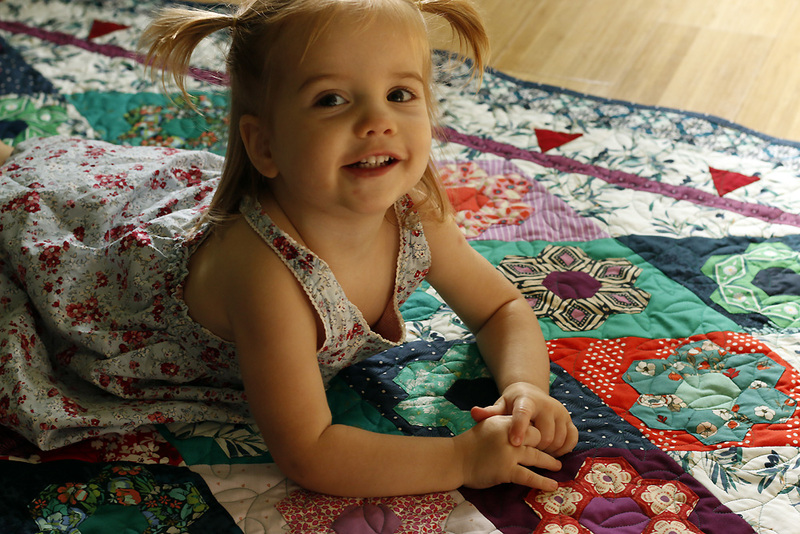 Everything felt too fussy for an already-busy quilt. 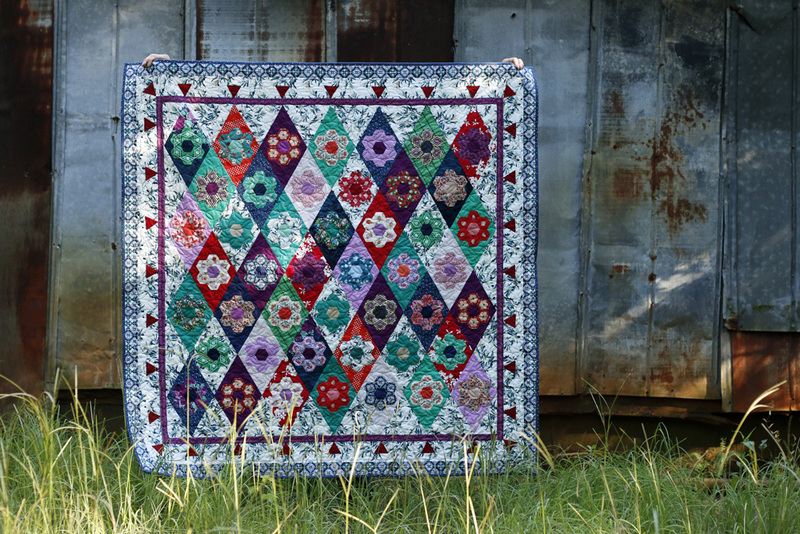 Between the diamonds, flowers, fussy cutting and bold colors, the quilt already had a lot to say. I chose to quilt this simple, leafy all-over pattern in a medium value green thread. The leafy design is perfect with our hexie flowers. And, yes, I quilted it all over - even on the flowers! 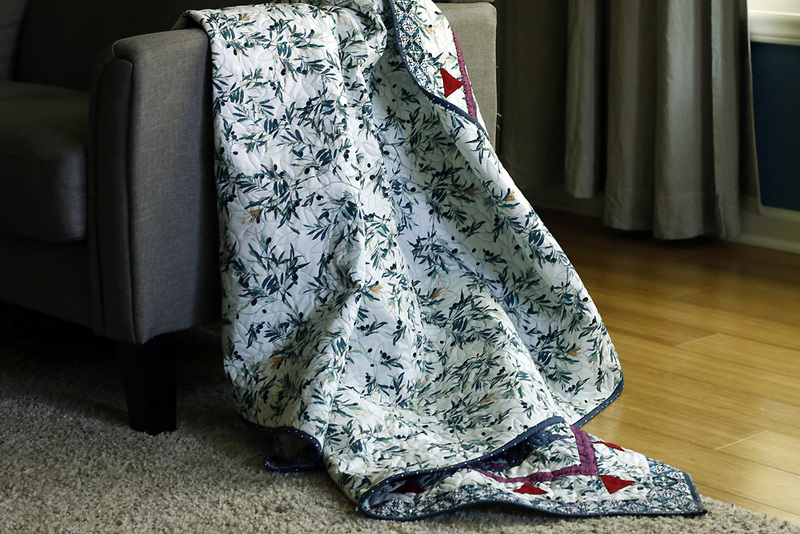 It's a loopy, modern leaf that feels kind of like a continuous eight quilting motif. I'm quite happy with the look and texture! I knew all along that my Kingfisher quilt would need to find another forever home. I almost slated it for one of my best friends, but it's way too pretty-girly for her tastes. So, off it goes to my Handmades shop.